How it's made / coming soon! Unique cast iron baby hand capped with a glass cabochon pendant on a stainless steel cord from new jewelry studio. Iron is a thrilling material to cast – it pours like water and explodes in fireworks when accidentally spilled and while molten, reacts violently with water. Not made from traditional "jewelry" metals, Rock ‘n’ Roll Baby is a gutsy, surprisingly comfortable adornment. Cast iron baby doll hand has a gunmetal blue patina protected by a matte lacquer seal. 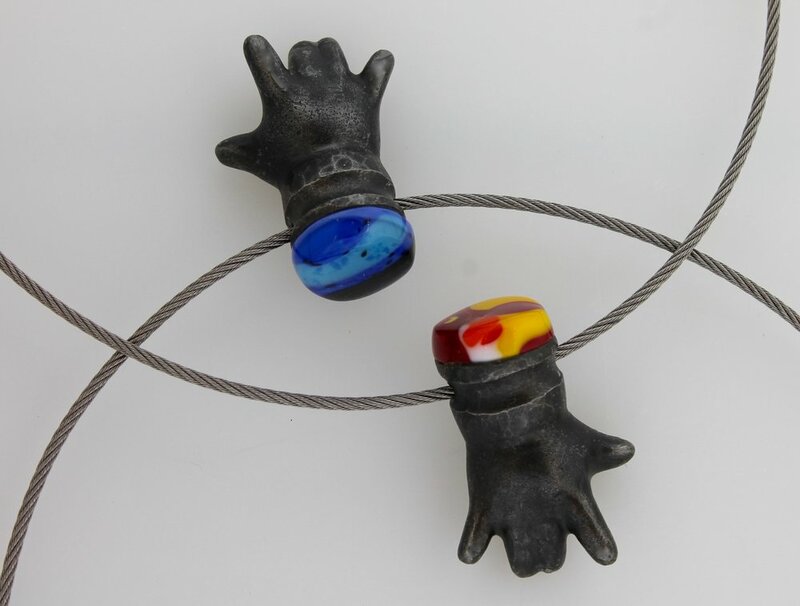 Capped by a one-of-a-kind intricately colored glass cabochon, Rock 'n' Roll Baby is supported by a sturdy 22" industrial-grade stainless steel neckpiece with two silver plated crimp eye hole findings connected by a barbed-wire "S" hook . Please apply perfume before jewelry and keep away from liquids. We respect your privacy and will not share this list. All the images are the property of Melanie Feerst Studio. Quirky and provocative with an industrial edge, work from Melanie Feerst Studio is inspired by dark humor, Japanese design and the medical or fetishized body. Fabricated with industrial rubber and studio-designed 3D printed parts, the pieces are occasionally deceptive (lighter than they look), multifunctional (ability to switch out parts or turn over) or nostalgic (parts repurposed based on their form).